Only for shipping within MALAYSIA. 1. All items will be sold at face value subjected to availability in the post office. So I am not making from you. 2. NO Cardboard packing. If your postbox is small or your postman fold your item, it will be your risk. So please consider this risk before ordering. 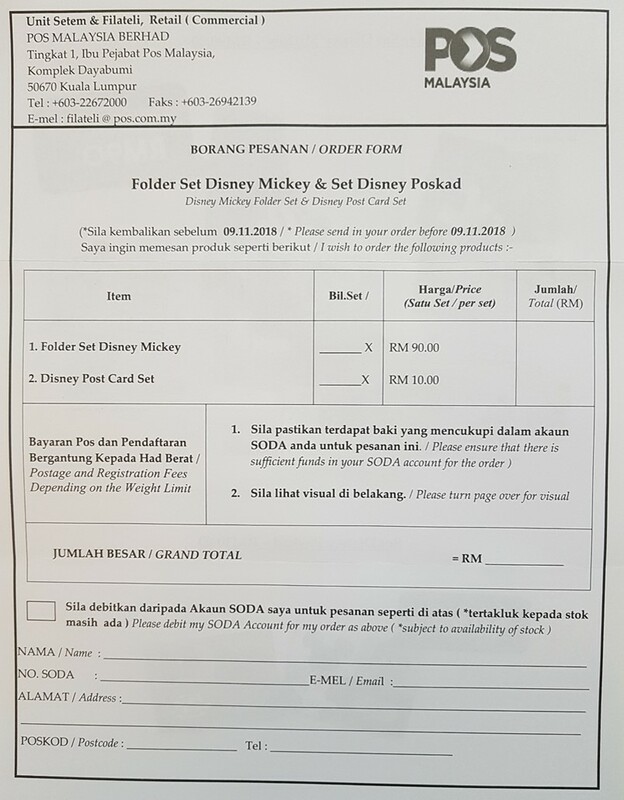 Folders and postcards: RM 15 West Malaysia / RM 25 East Malaysia up to 1 kg. 4. Immediate funds transfer. If you use any other bank and payment does not clear, I will refund you if the stocks are sold out by the time the payment clears. 5. Only for collectors. Dealers, please order with Pos Malaysia. Total Price = (Number of items Ordered x Price) + Pos Laju price – simple right? 7. Only until stocks lasts or I go back from post office whichever is earlier. 8. Whatever and however Pos Malaysia delivers to you (condition), you accept the risk. I am not the person delivering. 9. Tracking number will be provided. 10. Non-delivery : please deal with Pos Laju. If your area has Pos Laju delayed delivery problem, please DO NOT order. By ordering, you are agreeing to the above terms. After all it is at face value, just a favour to those who cannot get and want it fast. A lot of readers are confused on the postcards. The folder set contains 4 postcards that make up the image of a running Mickey. How ever you need to stick a stamp to send. The postcard set of 2 are pre-printed with valid postage stamps (of Mickey and Minnie) and are NOT included in the Mickey Folder. Last item: The First Day Covers are PRR-PRINTED. No stamps and no chop. Just printing. This is the first time in Malaysia history of pre-printed FDC. Thus I am not able to get any cancellation / chop. I am unable to send to Brunei at the moment.